Bedugul area locates on the mountain area of the central Bali, and it is famous for cool weather and great view. 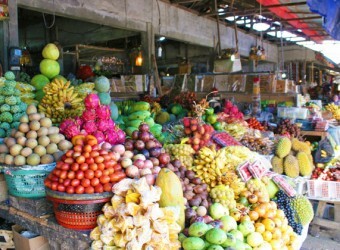 In Bedgul Market, you can see the highland vegetables, fruits, and flowers. Fruits are directly brought from the field, so they are very fresh. Prices are little bit expensive than other markets, however, there are all fresh, so the market is always busy with local people and tourists. Women in the market were always smiling. The market is selling mainly fresh vegetables and fruits. It was fun just looking. The price is expensive but you can bargain and negotiate to get better price!! The middle aged ladies in the market smile much. This market sells fresh vegetables and fruits. It was fun just to look. The prices are high, but you can buy cheaper depend on the price negotiation! !